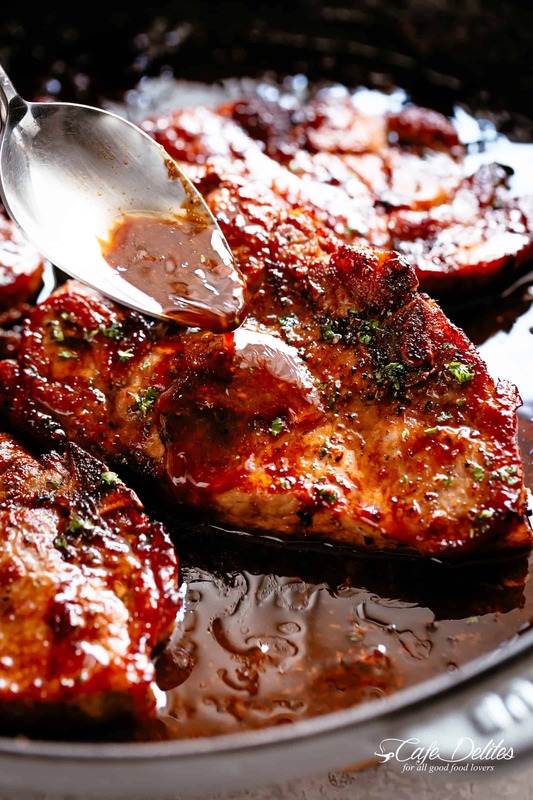 Juicy Honey Garlic Pork Chops with caramelised edges ready and on your table in less than 15 minutes! Smothered in the best 4-ingredient sauce! 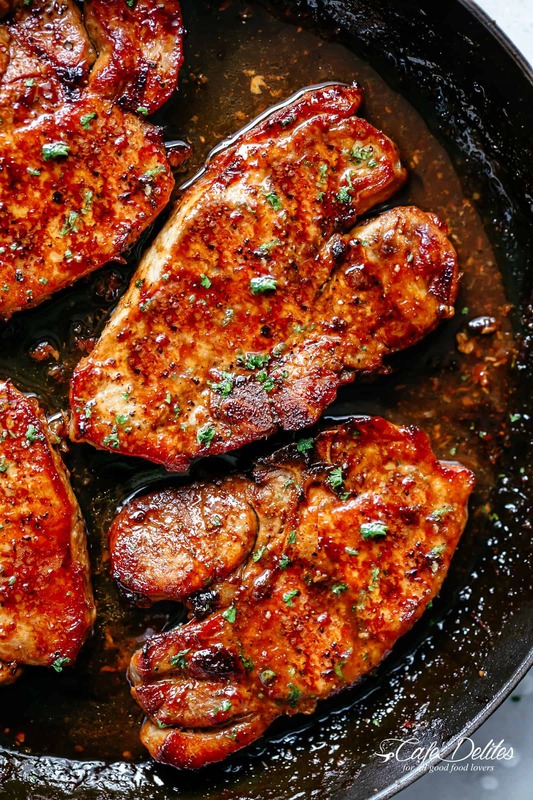 This Honey Garlic Pork Chops Recipe is so easy you won’t believe it when it’s done! No marinating needed, this recipe is an incredibly quick and delicious way to serve bone in or boneless pork chops — seared until golden then simmered and broiled (or grilled) in the most amazing honey garlic sauce! THE BEST part are those crispy, charred and caramelised edges! The demand for this recipe has been overwhelming! Since publishing my Easy Honey Garlic Chicken recipe years ago, the amount of emails coming in asking for a pork chops version has been crazy! Crazy GOOD because this recipe is one of the best pork recipes we’ve ever had. Delicious, juicy and tender chops that melt-in-your mouth. All done in a skillet or oven-proof pan then finished off under the broiler (or grill) for a couple of minutes to get those crisp edges. That last step is so worth it! Just look at the colour! You will not regret serving these Honey Garlic Pork Chops to your family! Rice wine vinegar (or apple cider vinegar/white vinegar). A small amount of water (or broth) is added to cut through the sweetness of the honey. The juices in the chops release into the sauce while broiling, creating even more flavour and quantity of sauce to serve with your pork. Season chops just before cooking to ensure they stay tender and juicy while cooking. Preheat your heavy-based pan or skillet and get it nice and hot before adding your chops. Sear for 4-5 minutes each side until crisp and golden. Pork Chop Marinade — no marinating needed! Melt butter in the same pan as the porks were seared in to keep those flavours going into the sauce, then add the rest of your ingredients. Baste pork generously with the sauce, then broil/grill for 1-2 minutes, or until edges are slightly charred. If you prefer oven baked pork chops, we’ve included directions in the Recipe Notes! Love Honey Garlic? Try these recipes! Honey Garlic Pork Chops Now On Video! Add pork back into the pan, baste generously with the sauce and broil/grill for 1-2 minutes, or until edges are slightly charred. Preheat oven to 390°F | 200°C. Sear seasoned chops in a hot oven-proof pan or skillet over medium-high for 2 minutes per side -- get them crisp. Remove chops and make your sauce following the recipe above (Step 3). Baste with sauce and bake in the oven for about 10-15 minutes, or until reaching your desired doneness. Broil/grill for 2 minutes to get those caramelised edges! 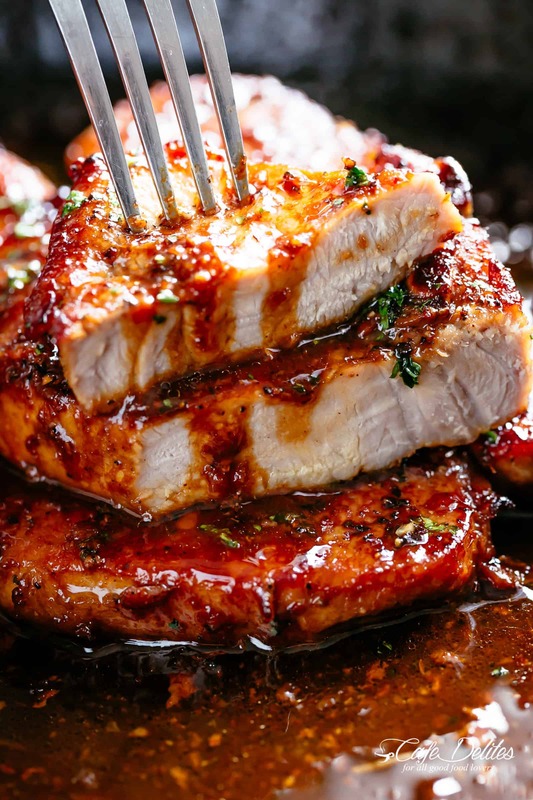 This honey garlic pork chops look scrumptious, will definitely give it a try. Thanks! I used this sauce on my pork chops last week and they were so delicious. This week I am cooking chicken breast with the sauce. Thanks for the delicious sauce! I’m going to definitely be using it for a lot more meal from now own! My family loved this recipe!! I love the recipe, I’m gonna try it. For Nadine re: medium-high heat in step 3the beginning of step 3 says to reduce the heat to medium to cook the garlic THEN increase it back to medium-high heat when adding the honey, water )or broth) and vinegar. Hope this helps! Made this with a pork tenderloin instead of pork chops, wonderful. This is the BEST recipe ever! Followed it to a T. The sauce is so good! We’ve added pork back into our dinner rotation because of it. Thanks! Thanks for this awesome recipe!! So yummy!!! I made this for my husband tonight and he enjoyed them. It was a nice change from the fried or grilled chops. Great flavor. Made it with mixed vegetables and teriyaki noodles. This is a keeper!! Looking forward to trying more of your recipes. Thank you. How would you recommend reheating these once complete? Thanks! Wow!! I can’t wit to try this with my my broccolini, Chinese broccoli, red onion, shallot, & garlic side dish!! This was easy and delicious! My husband and 12 year old daughter, who are very particular, told me this was a keeper! This recipe is absolutely amazing! My nine year old daughter said I was only allowed to make pork chops like this from now on, and that it was her new third favorite food. Which is a big deal coming from her. The only thing I did different was I added about a tablespoon and a half of sriracha sauce because our house likes a bit of a kick with our pork. This was a simple recipe that tasted like I spent hours cooking. Next time I will make extra sauce to drizzle over rice or potatoes. This was loved by the whole family. I loved it so much that I had to make this my first online comment for recipes! 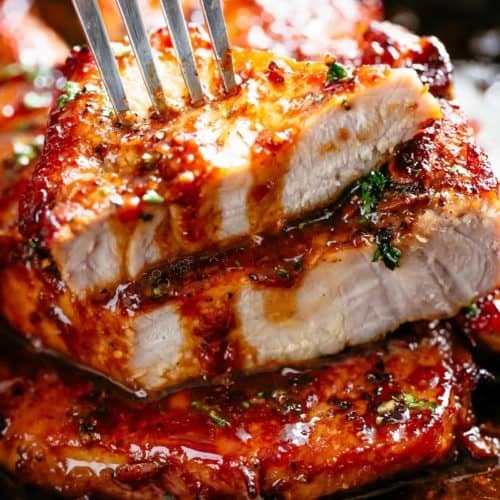 Thank you for sharing this amazing pork recipe. They were delicious! I only had two pork chops and the extra sauce was so good with rice. Definitely going to make this again! These were absolutely delicious! Might be the first time I made boneless chops correctly because they were moist and delicious! Thank you! Thanks to this site, I have made 2 over-the-top, hit meals in the past 2 days. I am going to start doing the meal plans this week and can’t wait! Best pork chop recepie ever! Love, Love, love! Karina, Karina, Karina!!!! Girl, you have a winner with this one! You are a foodie queen, I followed the recipe to the t and I got rave reviews from the whole family, I will be keeping this one in monthly rotation for sure. Thanks so much for all your great and oh so delicious recipes. The sauce was wonderful but the meat wasn’t tender. I bought expensive pork chops from Whole Foods and followed the recipe to the letter. I don’t understand what I did wrong. These were delicious, thank you! I discovered my broiler wasn’t working during the last step, but I cooked the sauce down a bit more and poured it over the chops. Fabulous! According to my husband, these were amazing 🙂 I’m a vegetarian so he usually cooks his own meat but I saw this recipe and had to make it for him. I’ve made a few of your chicken dishes and he loved those too. If you could feature an occasional vegetarian main that would be great, so I could try your food. Amazing recipe, goes very well with rice. Is there a way to save recipes to a personal recipe file here? Not at this time but it is in the works! I will keep this in mind when redoing my site soon! What if you do not have any wine vinegar or vinegar at all? Can you just leave that out and it still taste the same? It will alter the taste but it can be left out. It is a great additive though. So good….made it twice!! I did the oven version and they came out delicious!! Great recipe!! My sauce didn’t thicken as much as shown nor did it get that rich, deep color. It was still tasty but I think it needed to reduce more than slightly before putting them in the oven. Ok, I don’t understand how you set your broiler to med-high heat? Every oven I’ve had only broils at one setting 500 degrees. I have made these 3 times in the past 2 weeks. They have been a major hit in the house. Everyone loves them! Absolutely loved this easy recipe. My husband and I enjoyed our dinner tonite. I LOVE your recipes! How thick should the pork chops be? I am not a novice in the kitchen but I felt like one tonight thanks to you! The recipe was delicious and turned out amazing. I served the chops over white rice and spooned the remaining honey glaze over the rice then placed chop on top and added some broccoli and a slice of fresh garlic bread. Thank you for recipe. It was truly amazing and simple. And, as I type this and look about the kitchen, clean up is simple and will not be an all night affair! I made this for dinner tonight and it was excellent but I did have to sub the honey for maple syrup which was delicious. However, I didn’t broil it as my broiler only has one setting. I don’t really understand what you mean by medium high heat? You can either broil it or keep it at a medium to high heat. My oven has a few different adjustments on it compared to other ovens, I think. I hope you enjoy it! I love the maple syrup idea too. Thanks for sharing! When you say to broil them at the end does that mean in the oven? Yes, on the broil setting to finish baking the it. Hope you enjoy! These are hands down the best pork chops! I followed the baked pork chops section and dinner was a huge success. The flavours are outstanding! I’ve been cooking gourmet dinners since I started following you and my family is loving it! Peter I’m so happy to hear that you’re enjoying cooking for your family! Thank you so much for your feedback. These chops have been a success for so many readers…hopefully more will try them! Stumbled on this recipe after realizing I was running low on ingredients. These were probably the best pork chops I’ve made. Delicious and simple. Will definitely be keeping this recipe. Thanks! Instructions in step 2 says to heat oil in a pan at medium to high heat and sear pork chops. Then in step 3 it says to increase heat to medium-high (which it already is). In between cooking chops and adding sauce ingredients, is the temperature suppose to be lowered or raised? I’m not much of a cook so I have to follow a recipe exactly. A little clarification would be greatly appreciated. Thank you. The beginning of step three says to reduce the heat to medium to cook the garlic for about 30 seconds. THEN increase it back to medium-high when adding the honey, water (or broth) and vinegar. Hope this helps you! Normally when I do pork chops I do them in the smoker. I didn’t feel like going out in the weather today but had already thawed them. These are easily the best pork chops I’ve ever had. Definitely recommend this recipe to anyone. I used apple cider vinegar in mine, of the three options. This recipe was an absolute hit! I am usually disappointed by honey sauces but this was awesome! I tried it with chicken thighs first (thanks for taking the guess-work out by including instructions!) and tonight I’m going to use chicken breast. For the method to baked could we use that to baked the pork chops? Love that you can do the broiler or the grill! These look great! YES!! Me too! I like more options :)!